Okay, so I and my girlfriend (future wife at the time, now ex-wife, wonderful woman-now, just joking KP, love ya) used to sneak up to Fernandina Beach when I lived in Jacksonville, Florida. We didn't truly sneak up there, not like we were hiding from anyone, but it sounds more romantic. All I knew is we both loved the beach and we got tired of Jax beach because we beached all the time. I had no clue Fernandina was on Amelia Island back then, nor did I care. I did know there was some silly sign on the beach that read something to the effect of "No Alcoholic Beverages Beyond This Point" and we stayed on the side of it that was in our favor. There was no spring water or sports drinks in our cooler. Even if they existed way back then, that would have been terribly laughable. That was it. We drove up, claimed a piece of sand and basked in the rays. I favored going to Amelia Island (See Amelia Island - Beautiful Tennis Tradition) recently after recalling that Fernandina Beach was actually on the island and that the pro tennis ladies used to play the Bausch & Lomb Tournament there. Well, during our (present-day) trip to Amelia Island and our stay at the Omni, which was totally not planned or well-thought, I asked new-girlfriend (30 some-odd years have passed since aforementioned girl-friend, wife, ex, whatever) to have dinner at Fernandina Beach. We arrived at Fernandina, the town, and even having this oddly long memory of mine, I couldn't have differentiated it from that town in the Clint Eastwood movie, Blazing Saddles. Just kidding. But oddly enough, I met Cleavon Little walking down the street - still kidding. Honestly, it was late in the afternoon or way-early in the evening, somewhat in that dining-partying purgatory - sorry, way before that. Again, this was more like a road-trip than it was a planned vacation, which made it even better. You can get away with visiting coastal islands in the Southeast in late August without reservations. Roll the dice. The Omni Amelia Island Plantation, resort-wise was wonderful, it should be. Fernandina was quaint, picturesque and the few people we saw or had reason to speak with were wonderful. 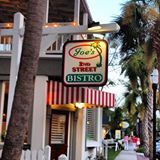 I had done the on-line search for several restaurants and found a few options and Joe's 2nd Street Bistro was on my list. I learned a long time ago traveling, not to place too much importance on locals' recommendations. Don't get me wrong. I always embrace the locals wherever I travel, but I don't want comfort food for a night out when I have been stuck behind a computer and on a few tennis courts the last several months. I want some pop, some zing. Fortunately, Fernandina's street signs, on the main street, also indicate which restaurants are down the side-streets - great concept. We parked and then walked around the ten or so blocks that constitute Fernandina (probably much more legitimately). It was quiet and I felt led to ask a few (I assumed) locals for some dining recommendations. No response sounded quite right. 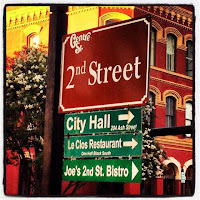 Joe's 2nd Street Bistro was it. We took a hard right off the main drag and headed a few blocks to Joe's. Unless I'm starving, I will easily walk into a restaurant and then walk out if I'm not getting the vibe, the smell or the sense of what's going on. Sam (Samantha, I imagine) met us at the door to seat us in a completely vacant restaurant. I loved it because I hadn't been away with my girlfriend for over a year - give us the entire restaurant. I was still concerned about the lack of other patrons, but I had to remember it was damn near four o'clock in the afternoon. Laurie showed up to serve us. She was pleasant and didn't turn on her charm 'til after she got to know us somewhat. That's so professional, comfortable and makes for good business. She was wonderful throughout our dinner. The decor is very pleasing at Joe's and I somewhat thought it didn't mix with the red-and-white striped awnings outside, but it works and probably will be a signature landmark, if not a way to find "Joe's". The restaurant is quietly decorated - it works. My girlfriend had a seafood and pasta dish, which she loved, and I opted for a veal and shrimp entree, which by description, seemed delicious, but hard to pull-off. Unless I prepare veal at home, I rarely eat veal out. The worst veal I ever had was in Charlotte, NC and the second worst was in Sicily - it seems like no one can cook veal properly. Well, Joe did, actually Ricky, the co-owner and chef, prepared one of the most tender pieces of veal and a wonderful covering, between a gravy and a sauce, that melded so well with the shrimp - unexpected and wonderful. We had a very enjoyable time there and after leaving the garden, where we had an after-dinner drink and Sam came out to chat with us, I almost met Ricky's other half, Mari. I wish I could have, but we turned back to the resort intent on enjoying our accommodations and the beach at night, heading to Saint Simon Island the next day. I have traveled abroad for years, more hesitant to do so nowadays, but there are plenty of wonderful places to travel, east coast or west coast, here in the U.S. 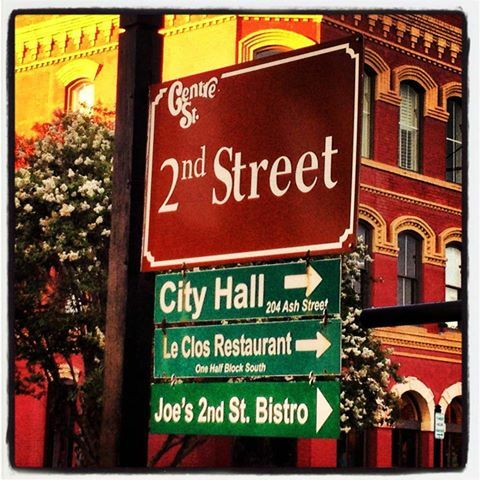 If you find yourself on Amelia Island or at Fernandina Beach, most definitely plan a dinner at Joe's 2nd Street Bistro. Oh, check out some of the many various dishes at the link provided. Thank you Sam, Laurie and Ricky.